(CBS/AP) COLORADO SPRINGS, Colo. - Fire crews fought to save the U.S. Air Force Academy and residents begged for information on the fate of their homes Wednesday after a night of terror sent thousands of people fleeing a raging Colorado Springs wildfire. More than 30,000 people frantically packed up belongings Tuesday night after the Waldo Canyon Fire barreled into neighborhoods in the foothills west and north of Colorado's second-largest city. With flames looming overhead, they clogged roads shrouded in smoke and flying embers, their fear punctuated by explosions of bright orange flame that signaled yet another house had been claimed. "The sky was red, the wind was blowing really fast and there were embers falling from the sky," said Simone Covey, a 26-year-old mother of three who fled an apartment near Garden of the Gods park and was staying at a shelter. "I didn't really have time to think about it. I was just trying to keep my kids calm." Wilma Juachon sat under a tree at an evacuation center, wearing a mask to block the smoke. A tourist from California, she was evacuated from a fire near Rocky Mountain National Park last week and, now, from her Colorado Springs hotel. "I said I hope it never happens again, and guess what?" Juachon said. The White House issued a statement Wednesday in which President Obama is planning to visit Colorado on Friday to survey the damage. "The President reiterated his administration's focus, through the U.S. Forest Service as well as the Department of Interior and FEMA, on continuing to bring all resources to bear to assist local responders in Colorado and a number of Western States currently being impacted by fires," said the statement. The full scope of the 28-square-mile fire, which doubled in size overnight, remained unknown. So intense were the flames and so thick the smoke that rescue workers weren't able to tell residents which structures were destroyed and which ones were still standing. Steve Cox, a spokesman for Mayor Steve Bach, reported that at least dozens of homes had been consumed, though he had no more precise figure. Indeed, authorities were too busy Wednesday struggling to save homes in near-zero visibility to count how many had been destroyed in what is the latest test for a drought-parched and tinder-dry state. Crews also were battling a deadly and destructive wildfire in northern Colorado and another that flared Tuesday night near Boulder. Colorado Springs Fire Chief Rich Brown insisted his personnel heroically saved many homes in the midst of the firestorm. The strategy: protecting houses adjacent to those in flames to prevent a domino effect and then racing to the next suburban hot spot, a technique he called "triage." "The radiant heat from home to home, or infrastructure, or trees, is unbelievable. You add in 60 mph gusts of wind -- it's unbelievable conditions," Brown told The Associated Press. Firefighters, he said, "responded exactly like they're trained -- as professionals, safely, yet aggressively." 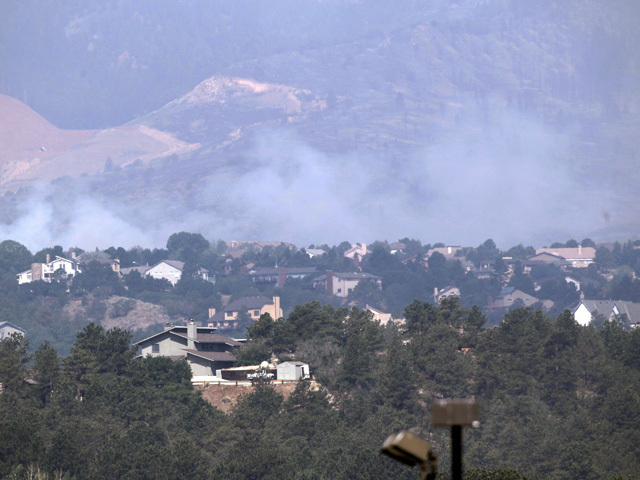 The Waldo Canyon Fire burned about 10 acres along the southwest boundary of the Air Force Academy campus. No injuries or damage to structures -- including the iconic Cadet Chapel -- were reported. With 90 firefighters battling the flames, Academy Superintendent Lt. Gen. Michael Gould insisted that 1,500 cadets taking summer classes and more than 1,000 freshmen arriving Thursday will be safe -- with campus ceremonies or housing to be moved away from the fire-hit area or off-campus if needed. The Red Cross struggled to accommodate victims at its shelters, with space enough for perhaps 2,500 people. Most evacuees were staying with family and friends. Colorado wasn't the only state affected by fire, as several burned throughout the parched West. Tom Harbour, director of fire and aviation management for the U.S. Forest Service, said that with several fires burning, there is competition for firefighting resources, but "we're still at a point where we've got lots of available assets to mix and match on individual incidents." Harbour said there's a difference between what incident commanders want and what they need to fight a fire effectively. And despite some criticism, he said the agency has been working to get equipment where it's needed most. Four military C-130 tankers, which can each carry up to 3,000 gallons of water, are positioned to cover the blazes burning near Colorado Springs and Fort Collins, as well as the entire Front Range if another fire were to break out, he said. At total of 18 air tankers were assigned to wildfires across the region. CBS affiliate KKTV Colorado Springs reports that at a press conference held Wednesday, Forest Supervisor Jerri Marr said it was a tough day for everyone, "But we've had way more successes than we have failures." Overall, there have been fewer fires and less acreage burned for the first six months of the year than for the same period in the previous six years. Some states are seeing fires earlier this year, but Harbour said resources are far from being exhausted. "With over 10,000 firefighters in the Forest Service and the ability to get over 700 aircraft of all types, we're feeling cautiously confident when you look at the season as a whole," Harbour said. -- A central Utah wildfire has destroyed at least 56 structures, mainly homes, and continues to burn with little containment, authorities said Wednesday. Officials expected the damage estimate to rise considerably as they continue their assessment of the fire-ravaged area between Fountain Green and Fairview and north across the Utah County line. Authorities were about halfway through their damage assessment of a fire that has burned about 46,000 acres, or 72 square miles. Officials returned to an evacuated area and found a woman dead Tuesday. -- Wildfires raced through southeastern Montana on Wednesday, torching more than 125,000 acres, burning dozens of homes and increasing the need for fire equipment and personnel already responding to four fires in the western part of the state. The Ash Creek fire near the Northern Cheyenne Indian Reservation has burned 18 homes and grown to 110,000 acres in less than 24 hours. "That's one of the most dangerous fires in the history of Montana," Gov. Brian Schweitzer said after a briefing in Billings. Rick Sallinger, of CBS station KCNC in Denver, has the latest on the huge blaze. To see his report, click on the video in the player above.